Most people have a basic understanding of what acupuncture is and know that its aim is to channels the energy channels within the body by inserting very fine needles in strategic sites that correspond with certain parts of the body. By doing this, some illnesses and discomforts seem to be eased and even averted without the need for, or in conjunction with conventional medicinal techniques. What Exactly Is Auricular Acupuncture? 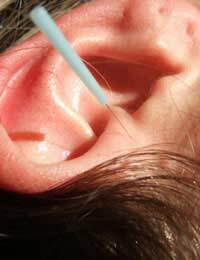 This form of complementary therapy is performed by applying needles to specific points of the ear with the aim of easing many complaints, traditionally chronic conditions and their symptoms. As the process has been developed new equipment can be used to achieve the same results and often electrodes are used as a replacement.Most people are astounded to know that there are almost 200 specified points on the human ear that can be treated to relieve the symptoms relating to many serious illnesses including those of the musculo-skeletal system, some of the abdominal organs and the liver.The ear is perfectly located to send messages through electrical impulses directly to the brain and can interfere with the normal pain pathways allowing clients to often find relief of their discomfort. The theory behind the practice includes understanding how the shape and form of the ear related very closely to the shape of a developing baby in the uterus and assume very similar characteristics with regard to formation. This representation can be translated into the transference of anatomy within the foetus to the corresponding point of the ear. For example the head of such a baby is represented by the ear lobe, so disorders of the head can be treated by the corresponding point on the ear lobe as this is in the same position as the head of a baby that is lying in a head-down position in the womb which is the most common foetal position. Most therapists who practice this treatment have found it to be useful for conditions such as back pain, shingles, stress and anxiety and many psychological problems such as insomnia and addictions. Therapists who are well trained and experienced in the procedures offer success rates of up to 95 % if the client is compliant and follows all advice offered.Some therapists specialise in treating physical disorders while others find a large client base for those with mental health issues and treating addictions such as smoking, drugs and alcohol. There are also many that offer to help anyone for any condition but if you are about to spend money on the treatment it may be worth carrying out some research on the practitioners training, experience and success rates. For most people, the thought of receiving acupuncture is normally worse than the actual experience as the needles used are extremely fine and are inserted so quickly that they are barely felt.It is also true that more sensation is felt after the needle has been inserted as the channels of energy are unblocked or encouraged to flow freely. Although acupuncture is still regarded as a complementary therapy it is now becoming more highly advocated as a beneficial treatment option by many conventional doctors and allied medical professionals. However, if you are suffering with any ill health it is not recommended to be used as a replacement for the usual medical diagnoses or treatments but in association with conventional medicine.